David Hymer is a trial lawyer who has extensive experience handling and trying high stakes lawsuits for a variety of corporate clients. David’s practice focuses on complex business and commercial litigation, which includes a significant plaintiff’s practice on behalf of corporate clients as well as a more traditional corporate defense practice. 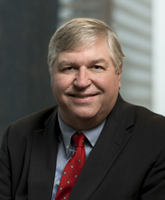 In addition to his trial work involving business and commercial disputes, David also has substantial courtroom trial experience in environmental, product liability, antitrust, and construction litigation. He has tried over thirty cases to verdict during his career. Clients for whom he recently has handled substantial matters include HealthSouth Corporation, Pharmacia Corporation, Monsanto Company, Caremark/CVS, and Saiia Construction Company. Most recently, David was lead counsel for HealthSouth Corporation in a trial resulting in a $2.8 billion judgment in favor of HealthSouth against its former CEO Richard Scrushy for damages suffered as a result of fraudulent financial reporting during Scrushy's tenure as CEO. David also was a key member of the trial team that successfully defended Pharmacia Corporation against personal injury claims allegedly caused by an environmental exposure. At the conclusion of the two-week trial, the jury returned a verdict in favor of Pharmacia and against five individual plaintiffs who claimed that exposure to polychlorinated biphenyls (“PCBs”) manufactured by the defendant caused them to develop diabetes or arthritis. David is recognized by The Best Lawyers in America in the fields of "Bet the Company" and Commercial Litigation, and is listed in Alabama Super Lawyers in the field of Business Litigation. He has been recognized by Benchmark Litigation's Guide to America's Leading Litigation Firms and Attorneys as a litigation star in the State of Alabama. The National Law Journal also recognized David in its annual listings of the nation’s top defense verdicts for his successful defense of a contractor against claims of defective work during construction of the containment vessel for a nuclear power plant in the State of Washington. The National Law Journal, Defense verdict recognized as one of the nation's "Top Defense Verdicts" in annual listing.